Among the pueblo artisans who make fine heishi today, Josephine Coriz stands out as the grande dame of this endeavor. When we say "fine heishi," we mean fine-diameter heishi, usually two mm. or less in diameter. It is a reduced group of people who make fine-diameter heishi today and it includes Josephine and her daughter Ramona Bird, Paul Tenorio and Carla Garcia of Santo Domingo Pueblo and Frank Ortiz of San Felipe Pueblo. Still others do this work (though much less prolifically), but the commercially available handmade product comes from a small group of makers who create these multi-strand necklaces composed of thousands, or tens of thousands of tiny beads. Fine heishi necklaces should be judged on two major factors: 1) the quality of the individual beads and; 2) the quality of the stringing job that yields a multi-strand necklace. Both aspects are key to the overall quality and, when invoking both standards, Josephine Coriz stands alone at the top of her field because of the quality of her beads and her ability to string silky smooth, multi-strand necklaces that have no equal, both in comfort and visual appeal. At her advanced age, Josephine now produces fewer necklaces, having turned over many of her designs to her daughter Ramona Bird for execution. But she does still make the most sumptuous of her necklaces, which usually range in strands from twenty to fifty. 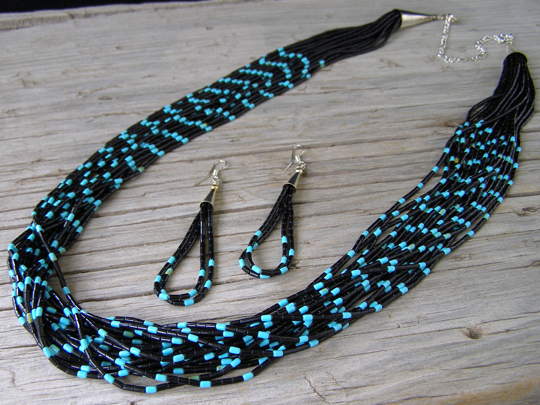 This twenty strand, full-length fine heishi necklace is made of jet and blue Kingman turquoise. Some of the Kingman turquoise heishi in these strands shows fine wisps of tan matrix here and there. The stringing of this necklace is superb and the silkiness of the strands is unmatched. A pair of double loop earrings accompanies this necklace. The strands are gathered in Sterling cones before terminating at the catch. A five-inch extension chain allows this to be worn at a length up to 32".